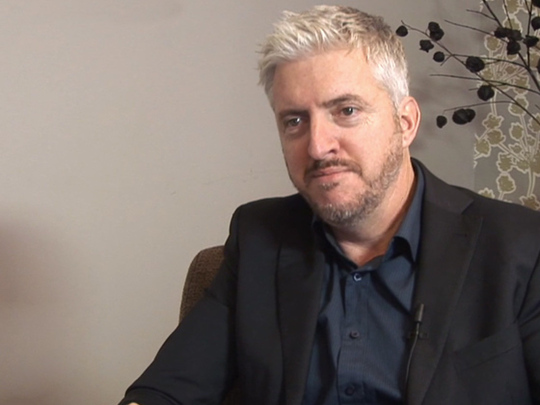 Anthony McCarten is an award-winning playwright, screenwriter and novelist, who has also directed two of his own feature films. His screenplay credits include Via Satellite, The English Harem, Show of Hands and Death of a Superhero. McCarten's most successful screenplay to date is Stephen Hawking biopic The Theory of Everything, which won him a BAFTA award for Best Adapted Screenplay in 2015. McCarten was interviewed for NZ On Screen when he was in Auckland for the 2015 Big Screen Symposium, organised by Script to Screen. This video was first uploaded on 27 October 2015, and is available under this Creative Commons licence. This licence is limited to use of ScreenTalk interview footage only and does not apply to any video content and photographs from films, television, music videos, web series and commercials used in the interview.